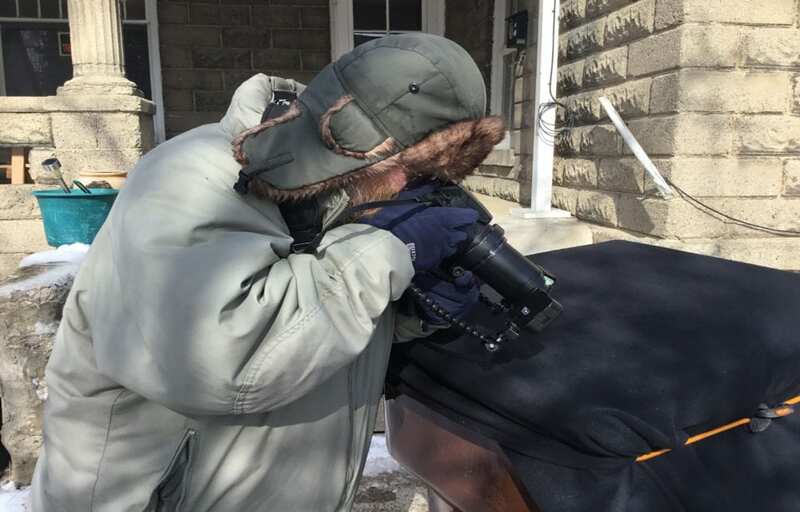 BUNDLED UP PHOTOGRAPHY… Rockwood sites a tiny snowflake which has landed on a piece of strapped down black fleece in front of his home, steadies his hand, and shoots multiple photos quickly, before a gust of wind blows the snowflake away. Wilson Bentley (Feb.9, 1865-Dec.23, 1931), known throughout history as “Snowflake” Bentley, for his incredible pictures of magnified snowflakes, died just a few days before Christmas 1931, in the season of the year most associated with snowflakes. Here in Montpelier, Ohio, all through the past three winters, another amazing photographer, Carlton G. Rockwood, Jr., has taken it joyfully upon himself to see if he can perfect the art of snowflake photography. He also added video lights to both sides of the camera to illuminate the snowflakes. “Snowflake Bentley never had it so good,” Rockwood laughed. “He used a candle under a glass where he placed the snowflakes, after carrying them there with a crow’s feather. He also had another candle, out about a foot away, and a mirror.” Bentley would catch a snowflake on a piece of black velvet, pick it up with the crow’s feather and put it on a cold glass of a light box so he could take a picture through a magnifying lens. He did it all in a freezing cold barn, and ended up dying of pneumonia. Another great influence for Rockwood has been “the snowflake bible”, Ken Libbrecht’s Field Guide to Snowflakes . The book was commissioned by NASA “because they want to know what we have here on earth so that they can compare them to snowflakes on other worlds,” Rockwood explained. Rockford refers often to this guide for information and training. “This book focuses on the science of snowflakes and I prefer to focus on the beauty and the art,” he said. There are 35 types of snowflakes and every snowflake fits in at least one, if not more of these categories. Online at snowcrystals.com, one can find a chart with the 35 types of snowflakes, and it is quite eye opening as most people are picturing only maybe seven of those when they think of a snowflake. Rockwood has a goal to get at least one really good picture of every type there is, and is well on his way. “I still don’t have a 12 branched star or a few of the others,” he shared, but was able to show some stunning shots of things not well known, such as a “simple needle,” or “capped columns” or “bullet rosettes,” as well as others. His photographs of the better known types are incredible and draw gasps of oooh and aaaah from anyone looking at them. Another goal of Rockwood’s is to “get the ultimate National Geographic snowflake photo!” He gets around 7 good pictures out of every 200 shots that he takes and keeps the ones that really strike him as special. Up in his very own dark room, are seven large notebooks with over 500 pictures in each, many of them his best snowflakes. As a photographer he captures a large number of the aspects of life, not just snowflakes, of course, but these past three winters have brought the addition of these little white diamonds on black cloth. Taking pictures in a high school class at the age of 14, with his teacher, Mr. Holstein, was just the beginning, and all these years later, after using his photography in the military and in his post military jobs, Carlton Rockwood, Jr. holds a camera and does what it takes to get great pictures, as if it were one of his own appendages. Rockwood plans to go to the State Fair this year with some of his Snowflake Photos and is really looking forward to that experience. He loves being the official Bean Days Photographer in Montpelier as well as taking pictures at the Veteran’s Ball each year. Snowflakes are just one aspect of his photography, but certainly an extremely enjoyable one. Be the first to comment on "Montpelier Man Captures The Beauty Of Snowflakes"